Located in North Portland on Hayden Island. As a resident of the beautiful Willamette Valley, you're used to an enhanced level of quality in pretty much everything. BJ's Restaurant & Brewhouse brings this same mentality to everything we serve, from our housemade soups, fresh salads, flavorful entrées and our carefully handcrafted beer. We're constantly Pursuing Amazing™ and we've got something for everyone to enjoy in our extensive menu, from pizza to pasta to burgers and more. If you're looking for something on the lighter side, try one of our lower-calorie EnLIGHTened Entrées® or an expertly prepared gluten-free menu option if you have special dietary needs. We also feature a great kids' menu, handcrafted sodas, delicious desserts and much more. At BJ's Restaurant & Brewhouse, our passion for quality is evident in everything we serve, especially our incredible selection of craft beer. No matter your individual taste, we have something for you to enjoy from our bold Tatonka® Stout to our flavorful HopStorm® IPA. We also offer a great selection of seasonal and top-quality limited edition Brewmaster's Reserve beers. Our friendly, relaxed atmosphere and world-class service makes it easy to enjoy any of our carefully crafted options. 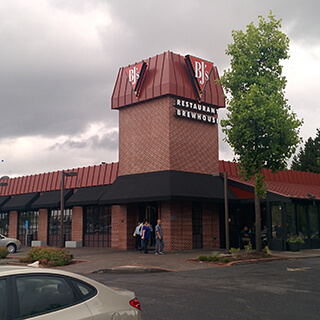 Whether you're looking to catch a 'Blazers game with wings, beers and friends or want to enjoy an outing with the entire family, BJ's Restaurant & Brewhouse is an excellent choice. We look forward to seeing you at BJ's Restaurant & Brewhouse on Jantzen Beach in Portland, OR! Our restaurant is the "go to" place for locals, vacationers, and sports teams for 19 years.